There was a quaint, hip restaurant that I used to frequent, located in one of the trendy suburban locales of Mumbai, whenever I happened to be in that area. Why I stopped going there is another story altogether. These potatoes were a part of their menu. The semolina formed a beautiful crust on the potatoes, which left a lingering taste. When I had a conversation with the chef there, I discovered that the ingredients were few, the procedure easy and the result exotic! I always look for interesting ways to cook potatoes. I have many favourite potato memories, right from a simple yet divine baked potato topped with delicious sour cream and herbs whilst on a tube rail from Frankfurt to Zurich, the intricate aloo kebabs prepared by my favourite north Indian chef, Sharief at the ITC Grand Maratha Sheraton, Mumbai, ajji’s (grandmother’s) aloo ras palya (cubes of potatoes floating in a yummy watery gravy) and a few from the culinary adventures in my very own kitchen. It’s marvelous that potatoes can turn from a simple humble dish to an exclusive piece de resistance on the dining table. Most people I know love potatoes. One person who doesn’t very much approve of them is my father. When I included semolina potatoes (a version of the potato dish of the suburban restaurant mentioned above) in the menu when he was visiting us for dinner on one of his business trips to Mumbai, I was taking a big risk. I was happy to note that he went in for a second helping. Today, when I decided to make semolina potatoes again, I also thought of inaugurating my Le Creuset frying pan lying in the cupboard. Semolina comes in various sizes. It is important to use the small sized or fine variety for this dish. You can use 3 tbsp olive oil and skip the butter if you wish, but I love to use the butter at times for the colour and taste it gives the potatoes. In a pan, bring the water to a boil and add in the salt and scrubbed potatoes and cook till tender until the potatoes can be pierced with a fork or a knife. Cool and peel the potatoes. While the potatoes are cooling dow, in a frying pan or skillet on the lowest flame, roast the semolina until golden brown. This should take about 3 to 4 minutes. Keep aside. In the frying pan or skillet, heat the olive oil and butter on a medium flame and add in the paprika flakes and coriander leaves. Stir in the potatoes and cook for 4 to 5 minutes or until they change colour to a nice light brown. Sprinkle the semolina and salt and mix properly. Continue cooking for a minute or two. The semolina forms a lovely crust over the potatoes. Serve hot. I have to try this! I have to wait until it stops snowing for a while so I can get to the grocery store. 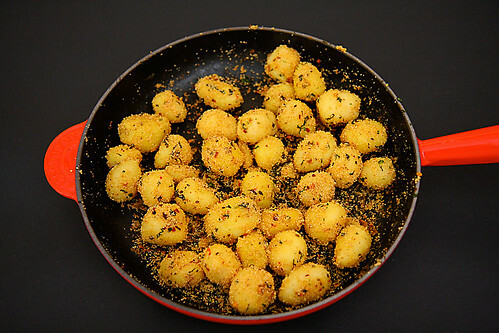 We just finished our Pongal lunch and these semolina potatoes still make me want to hog ten Le Creuset pans of these. Cheers! These look gorgeous! I love potatoes, so it's great to have a different recipe for them. They look so pretty and tasty! I must try them! Sara, Katie-Rose: Let me know how you like them. Mihir: Pongal lunch? Wow! I missed having one today. you have a lovely space here, and I am glad to discover it. Using rawa to add the crunch in a subzi is entirely new to me. 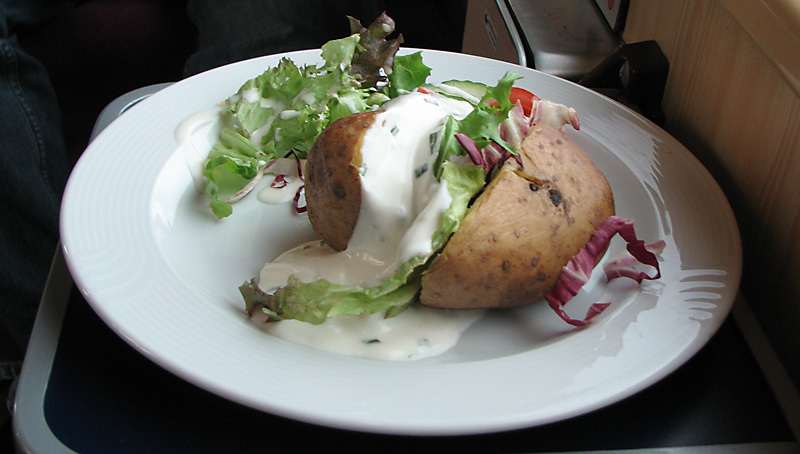 Very simple & I bet tasty (yeah who does not like potato?) recipe. thanks a lot for sharing. i'm definitley going to try this out. What a unique way to prepare potatoes! Sounds great. Thats so simple and unique way of preparing potatoes! will be trying out soon, thanks! this looks scrumptious! !…I will try it look and let you know how it turns out! I loved this recipe…its awesome.But instead of paprika try using crushed chilli..It comes out very well. I really like this idea; I've never had anything like those! Hey 🙂 Is there any replacement for paprika ? Pratiba: You can substitute paprika with the Indian red chilli powder. Hi.. Its my first time to your site. Can I just say how wonderful you are?! You've probably heard every word of appreciation you could possibly get. Add me to your long list of followers! Such a wonderful recipe! I'm a 3 month old food blogger & your presentation & writing definitely helps a lot!!! Hi Anushruti, do I need to peel the potatoes? Also, I have a packet of Marks & Spencer's Roast Potato Seasoning. The packet says 'sprinkle over parboiled potatoes before roasting in the oven'. (Of course, I won't be using an oven) And yes, the durum wheat semolina is a major ingredient in this seasoning! Can I possibly use the seasoning in this recipe? If so, how do you recommend? 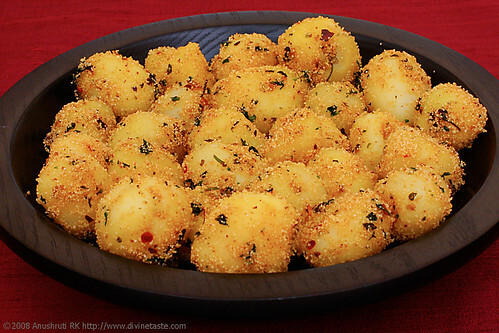 Pl do reply urgently since I intend to make these Semolina Potatoes tomorrow itself! Kavi: Thanks for your appreciation. Good luck with your blog! Isn't it basilico where you get these potatoes? I love them. Stumbled upon this whie i was searching for upma recipe. Please upload an upma recipe no. I love your recipes. Navjyoti: 🙂 I do have a masala upma recipe on divinetaste. Will post a simple version too. I however did the seasoning with cumin,slit green chilly, curry leaves n finely chopped mint leaves . pakhee: Glad you enjoyed the dish. Incredible easy and creative dish. I had made this dish today and was a hit in the family. I loved the taste too. I did not have fresh coriander with me and substituted it with oregano. The potatoes were crispy and spicy from outside and soft from inside. Thank you for sharing such a simple yet delicious recipe. I love your recipes, photography and write-ups. Ujwala: This is one of my top favourites. Glad you liked it. Wish your family and you a great 2015! Read your most recent post. Liked it. My aim to cook well crossed paths with ur blog and this is a acquaintance that I value and come back to frequently. The first recipe that I read on your blog was of red velvet cupcake. Although I am yet to try it. It's one of the good aspects of internet…allows access to treasure troves of knowledge,one of them being your blog! Made semolina potatoes for lunch. Noticed butter in ingredients. However did not see it in under Method. Read and reread. Am I missing it? I used both olive oil and butter. Did not have fresh coriander leaves. So substituted it with kasuri methi. I liked the texture. nageshwari: Thank you for your valuable words. Butter is optional actually and this is an updated recipe. Will make the required changes in the recipe as well. I confess that after watching your video on semolina potatoes, I was so eager to try it out. As fortune would have it, I found baby potatoes in the vegetable market and made this today for my family. Very happy to report that they loved it. Feeling thrilled! Thanks… I eagerly look forward to more of your videos. Can I try this with regular potatoes also? I understand baby potatoes come out better….but will it be ok with regular ones too? Probably cut in 4? You can try but this recipe is best made with baby potatoes.